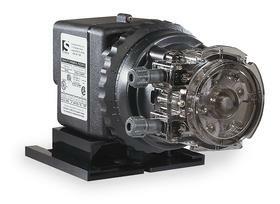 A peristaltic pump is a type of positive displacement pump used for pumping fluids. Usually, the fluid is contained within a flexible tube fitted inside a circular pump casing (though linear peristaltic pumps have been made). A rotor with a number of "rollers", "shoes" or "wipers" attached to the external circumference compresses the flexible tube. As the rotor turns, the part of the tube under compression closes (or "occludes") thus forcing the fluid to move through the tube. Additionally, as the tube opens to its natural state after the passing of the cam ("restitution") fluid flow is induced to the pump. This process is called peristalsis and is used in many biological systems such as the gastrointestinal tract. In simpler terms,the peristaltic pump works by squeezing a flexible tube that is filled with liquid so that the liquid squirts out of the open end of the tube. In water treatment, peristaltic pumps are used mainly to inject chemical treatment agents into pressurized water lines. They are commonly used to inject chlorine, soda ash, polyphosphates, and hydrogen peroxide, for example. The usual installation on residential wells is before the well's pressure tank. Above, a popular peristaltic pump used for injection of water treatment agents. More about peristalic pumps and chemical injection equipment.